I don't know what I like better about this. 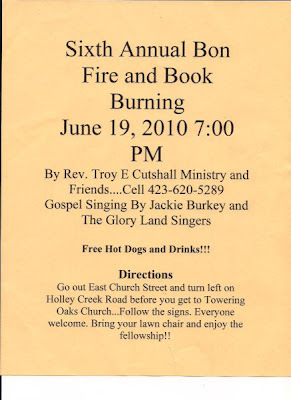 The fact that there are free hotdogs or that there have been five other occasions to burn books. Damn my luck! This is the night we are hosting the group that won the bid on the Greek feast! I can only imagine the grand fellowship that springs from burning bookings and firing bons! You can use the bonfire for the weenie roast. Nothing tastes better than a "Catcher in the Rye" flavored hot dog. If I can burn every copy of the Bible and every book about the Christian religion I can find at the bonfire, then I'm in. Now that would be entertaining watching the Dr. bring a wheelbarrow full of King James Bibles to add to the bonfire. And it will be complete because there will be the Holy Land Singers! Just wow whee! It's really all about the fellowship. 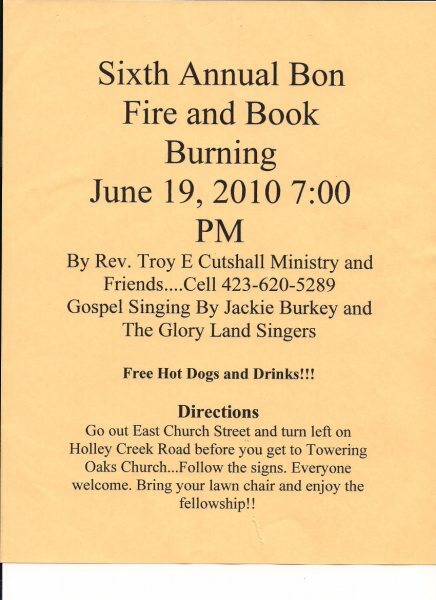 Other burnings featured Harry Potter books. Here is a Facebook page about it. On the bright side it was not a "Book Burning" AND "Heretic Roast". That is, of course, unless the weenies were roasted in effigy... Now that's a funny thought!!! I was thinking of you, Bob, when I posted this. Could be an opportunity for the library to be a sponsor?